Here is my sweet little heart that I am making for my husband. This sweet heart design is from Barbi's blog. She has wonderful patterns on her blog and is a fantastic stitcher. If you do stitch her designs, please send her a photo and make sure you link her blog to your post. 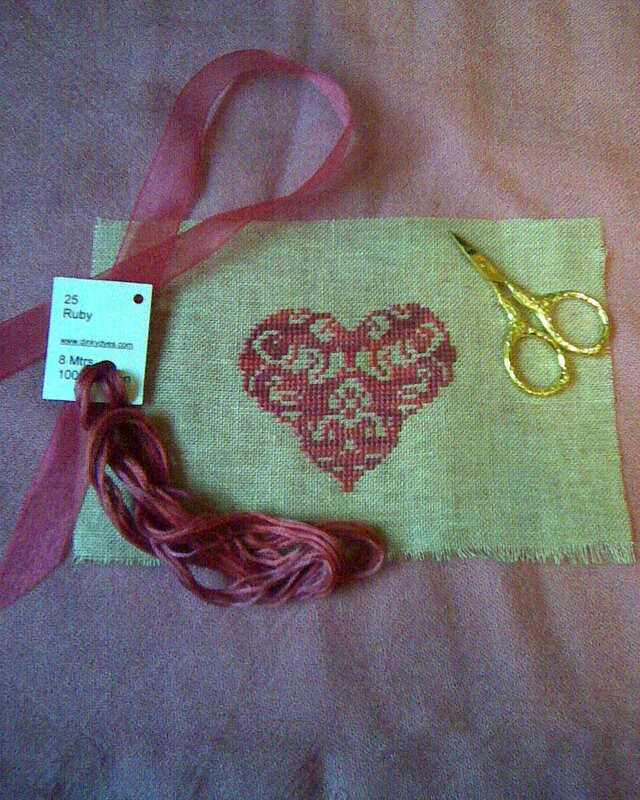 I really hope I can find the perfect fabric for the back of this little heart. I think I want to personalize it a little bit with our initials, but I need to get cracking! Only two more weeks till Valentine's Day and I have to sneak in moments when my husband isn't around (like today!) I used R & R reproductions linen in St. Valentine's Blend, how very fitting, with Dinky Dyes Ruby Red thread. I found the ribbon randomly a few weeks ago searching in a drawer and lo and behold, it matches the thread colour perfectly! Thank you for visiting my blog today! I'm glad to find someone else locally who loves to stitch. I will spend time later to go through your blog. I blush! :) Thank you that we have! That is a gorgeous design! I love the thread you used and it looks great on the green linen. It's really pretty! Have you finish finished it yet? I checked out Barbi's blog, she has great free charts! New Linens and Patterns Oh My!